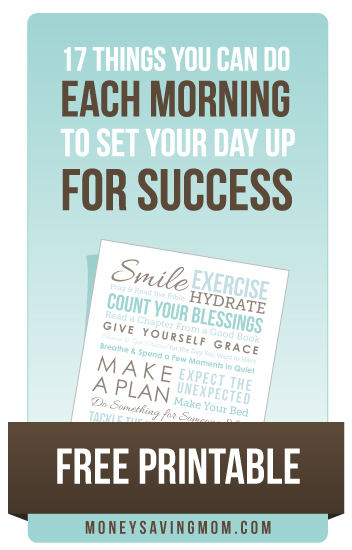 So many of you enjoyed my post on 15 things you could do to set up your morning for success that I had Joy from FiveJs.com create a printable for you. This free subway art printable would be perfect to print and hang in your bathroom, bedroom, or on your refrigerator to remind you to kick off your morning well. Click to download the free printable (includes a color and black/white version). Early to Rise Challenge: "It's Your World, So Change It"
Early to Rise Challenge: The Halfway Mark! Early to Rise Challenge: Don't Settle for Average! Looking for more? Read more posts about Early to Rise Challenge. Thank you, Crystal and Joy! Thank you so much for this! I have an unused frame I didn’t realize was waiting for something like this : ). Thanks for this! The earlier I get up, the better the day seems to go. But of course, that doesn’t always mean I’m bounce out of bed. Glad for the extra encouragements I can print and put on the fridge to “remind” myself as I’m preparing my coffee! I can’t wait to print this out and hang it up!!! Thank you!!!! I happen to be having a very frustrating and hormonal day, and this was exactly what I needed. I just printed it and it’s going up in my study, or maybe by my bed tonight! Thank you! I just wanted to share – I printed up two of these (one in black and white, one in colour) and my 10 year old son asked if he could have one to hang in his room! I thought it was awesome that he wanted to start his day right. Thank you Crystal for all you do! I so need this. Thanks.